If you are already employed, you must immediately show your call-up instructions to your employer and draw his attention to the fact that he is, in terms of the Defence Act, liable to afford his employee all reasonable facilities to render national service. You will be paid at the rate of 50c per day (Sundays and public holidays included) from the date you leave your home until the date on which you again reach home. Should your circumstances warrant it, you may, in addition to your pay of rank, be paid a dependantâ€™s allowance. Full details of this allowance will be available on reporting for service. If you intend applying for this allowance, you must bring a certificate from your employer, stating how much you will be paid by him during your absence from work, as also your marriage certificate, if married. Until you report for service, you must contact the Registering Officer, SA Defence Force, Private Bag 28l, Pretoria, in connection with anything concerning your national service. Until such time as you report for service, you must advise the Registering Officer, SADF, immediately of any change in your address. The Defence Act provides that failure to do so makes you liable to a fine of up to R200 or six months imprisonment. If you have valid reasons why you cannot report for service, you must immediately address an application in writing to the Secretary, Exemption Board, Private Bag 281, Pretoria, stating your reasons clearly and attaching any supporting documents or certificates (e.g. medical certificate). Unless and until you are notified of the result, it is compulsory for you to report for service as directed. National servicemen who, after commencing their national service, are notified that they have to write supplementary examinations in one or more matriculation/Std 10 subjects, may be granted leave for this purpose. This leave includes, if required, twenty-one days' unpaid study leave, plus paid leave for the period of the actual examinations and travelling time. Travelling costs to and from the examination centre will be at State expense. Any person who has failed his examinations and who plans to attend school full-time for a further year must, if he has already commenced service, submit an application for postponement of service to his commanding officer. The commanding officer will forward the application to the Exemption Board for a decision. If such a person has not yet commenced his service, his application for postponement must be forwarded without delay, direct to the Secretary, Exemption Board, Private Bag 281, Pretoria. No remuneration or liability in the event of injury, etc., will be paid or accepted i.r.o. the use of private transport to and from your place of service and no parking facilities for private vehicles are available at such places. If you have not been medically examined previously, you will again be subjected to a medical examination on reporting for service. If found to be unfit for service, you will be discharged from the Citizen Force. 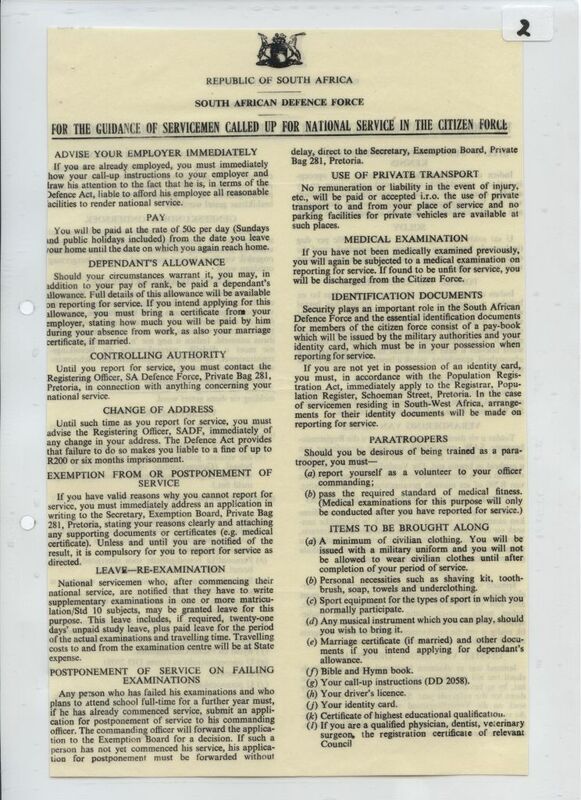 Security plays an important role in the South African Defence Force and the essential identification documents for members of the citizen force consist of a pay-book which will be issued by the military authorities and your identity card, which must be in your possession when reporting for service. If you are not yet in possession of an identity card, you must, in accordance with the Population Registration Act, immediately apply to the Registrar, Population Register, Schoeman Street, Pretoria. In the case of servicemen residing in South-West Africa, arrangements for their identity documents will be made on reporting for service. (b) pass the required standard of medical fitness. (a) A minimum of civilian clothing. You will be issued with a military uniform and you will not be allowed to wear civilian clothes until after completion of your period of service. (b) Personal necessities such as shaving kit, toothbrush, soap, towels and underclothing. (c) Sport equipment for the types of sport in which you normally participate. (d) Any musical instrument which you can play, should you wish to bring it. (e) Marriage certificate (if married) and other documents if you intend applying for dependantâ€™s allowance. (f) Bible and Hymn book. (g) Your call-up instructions (DD 2058). (k) Certificate of highest educational qualification.